An article posted by the Department of Archaeology at the University of York - Down to the last detail: How our ancestors with autistic traits led a revolution in Ice Age art - reports on new research that associates a common characteristic of autism with Ice Age art. The remarkable accuracy of the charcoal drawings of lions in the End Chamber of Chauvet cave in France clearly captures a hunting scene in progress. Researchers at the University of York are claiming that the ability to focus on detail, a common trait among people with autism, allowed realism to flourish in Ice Age art. According to the report, around 30,000 years ago realistic art suddenly flourished in Europe. 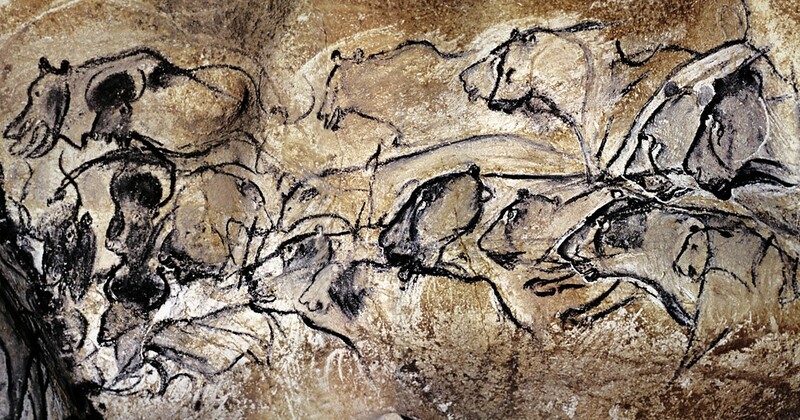 Extremely accurate depictions of bears, bison, horses and lions decorate the walls of Ice Age archaeological sites such as Chauvet Cave in southern France. The ursine movement is captured to great aeffect in the Recess of the Bears in Chauvet. In the 1960's some researchers argued that psychotropic drugs were behind the detailed illustrations. The authors of the new study discount this theory, arguing instead that individuals with 'detail focus', a trait linked to autism, initiated an artistic movement that led to the proliferation of realistic cave drawings across Europe. Lead author of the paper, Dr Penny Spikins from the Department of Archaeology at the University of York, claims that detail focus is what determines whether you can draw realistically; you need it in order to be a talented realistic artist. This trait is found very commonly in people with autism and rarely occurs in people without it. The idea that people with a high degree of detail focus, many of which may have had autism, set a trend for extreme realism in ice age art is a more convincing explanation. Dr Spikins added that individuals with this trait - both those who would be diagnosed with autism in the modern day and those that wouldn't - likely played an important part in human evolution and survival as we colonised Europe. As well as contributing to early culture, people with the attention to detail needed to paint realistic art would also have had the focus to create complex tools from materials such as bone, rock and wood. These skills became increasingly important in enabling us to adapt to the harsh environments we encountered in Europe. How Do We Explain 'Autistic Traits' in European Upper Palaeolithic Art? Traits in Upper Palaeolithic art which are also seen in the work of talented artists with autism, including most obviously an exceptional realism, remain to be explained. However any association between the famously evocative animal depictions created in the European Upper Palaeolithic and what is commonly seen as a 'disorder' has always been contentious. Debate over these similarities has been heated, with explanations ranging from famous works of Upper Palaeolithic art having been created by individuals with autism spectrum conditions, to being influenced by such individuals, to being a product of the use of psychotropic drugs. Here we argue that 'autistic traits' in art, such as extreme realism, have been created by individuals with a cognitive extreme of local processing bias, or detail focus. The significance of local processing bias, which is found both as a feature of autism spectrum conditions and in artists with exceptional talent at realistic depiction who aren't autistic, has implications for our understanding of Upper Palaeolithic society in general, as well as of the roles played by individuals with autism spectrum conditions. Editor's Note: We are often asked about the accuracy of the depictions of animals, such as those found in Chauvet. The attention to detail is remarkable, and obviously from memory. The animals were not hunted then killed then studied. The paintings depict motion; they were observed in motion, such as the beautiful painting of the bear (above) in the Recess of the Bears in Chauvet.